French multinational Lafarge's limestone quarries in Meghalaya, which supply raw material to its cement plant across the border in Bangladesh have been shut down by the government. This comes nearly a year after an official of the Union Ministry of Environment and forests (moef) found that the mining lease area was forestland. The official had also found that environmental consultants and a local forest official had given false information about the nature of land to ensure clearance of the project. The temporary closure order, issued on April 30, 2007, is a major setback to India's first sub-regional private sector project under the much-hyped Look East Policy. The Indian half of the venture was already mired in controversies related to acquisition of tribal lands and subsequent mortgage of those lands to foreign banks in Bangladesh. Limestone dependent The project involves mining and transport of limestone from Shella-Nongtrai villages in Meghalaya's East Khasi Hills district to a cement plant in Chhatak, Bangladesh (see map Limestone travails), via a 17 km-long cross-border conveyor belt. The us $225 million, state-of-the art plant, Lafarge Surma Cement, depends entirely on limestone from Meghalaya's quarries. The project, initiated in 1997, plans to produce 1.2 million tonnes of cement annually. The plant started producing and selling cement in 2006. The quarries, which are about 100 km from Shillong, are operated by a subsidiary of Lafarge Surma, Lum Umiam Mining Pvt Ltd. The mining rights, however, are owned by another Lafarge Surma subsidiary--Lum Mawshun Minerals Pvt Ltd. Mawshun has a 35-year lease agreement with the villages for about 100 hectares (ha) for the mines and the liberty to use another 26.6 ha for mining-related activities. Lafarge Surma owns 74 per cent of this company and the remaining is owned by two Khasi tribesmen. The deal India and Bangladesh signed an agreement for uninterrupted supply of limestone to the Chhatak plant in 2001, following which the company obtained environmental clearances from moef and other state bodies. But it now appears these clearances were obtained on the basis of misleading descriptions. 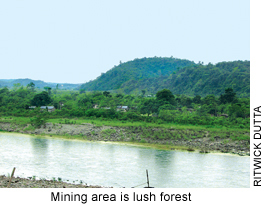 In a certificate dated June 13, 2000, Khasi Hills' divisional forest officer wrote "the proposed...site for Limestone Mining Project at Phlangkaruh, Nongtrai, East Khasi Hills District, Meghalaya leased out by the Lum Mawshun Minerals Pvt. Limited, is not a Forest area as per Supreme Court judgment and does not fall under...notified Reserved or Protected Forests". Similarly, Environmental Resources Management India, a Delhi-based company that prepared the rapid environment impact assessment for Lafarge, described the project site as an area of "uneven terrain with a rugged topography" where "the terrain undulation and the rock texture do not allow normal plant growth". It further said "This is an area of low botanical and floral diversity. Covered with rocks and debris, this area can be termed as a near wasteland." But B N Jha, former chief conservator of forests, Meghalaya, who brought the violation to light last year, rubbishes this report. Jha, who's since been transferred to Patna, visited the area on May 24, 2006 and discovered the mining site was surrounded by thick natural forests. He found that about 20 ha (already mined) was strewn with tree trunks, while the remaining unmined area had stretches of natural forest with tall trees and dense vegetation. "You don't need to be an expert to see that it's forestland," he said. Jha then apprised moef of the matter. According to the Forest Conservation Act, 1980, any project using forests for non-forest purposes needs to obtain a forest clearance from the central government. And a 1997-Supreme Court order says that it includes any land that fits the dictionary meaning of the word forest, irrespective of who owns the land. Clearly, the company had violated the act. But the ministry failed to take any action then. On April 9, 2007, Jha shot off another letter to moef stating his case. He said the division forest officer had "falsified the facts probably intentionally to effect exemption of land from the clearance and provide unjustified escape for the company". He also recommended that Environmental Resources Management India be blacklisted for fudging reports and misleading the government. Following this, moef sent Lum Umiam Mining Pvt Ltd a stop-work order and asked the company to apply for fresh clearances under the Forest Conservation Act, 1980. 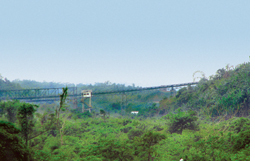 Lafarge has challenged the order in the Supreme Court claiming it had not sought forest clearance as the mining area had been certified as "not falling under forest area" by the state and the Khasi Hills Autonomous District Council (responsible for monitoring land use and clearing projects in the Schedule vi districts of East and West Khasi Hills). The company also sought permission to transport 600,000 tonnes of already-extracted limestone lying at the quarries to its Bangladesh plant, in view of the current monsoon season. The Supreme Court has, for the moment, upheld the moef order and referred the matter to its Centrally Empowered Committee--that investigates encroachments on forestlands. It hasn't given Lafarge interim permission to transport the already-mined limestone. Meanwhile, district council chief executive H S Shylla says the council and the state government were conducting separate inquiries to find out who was responsible for clearing the project. There's more, however, to Lafarge's current cup of woes. A petition filed on May 17, 2007 by Shella Action Committee, comprising a group of Shella residents, has questioned the legality of the process through which the company's Megahalaya-based subsidiaries acquired land in their village and then used it as security for a us $153 million loan from seven major foreign banks to build its plant in Bangladesh. (The banks, all of which are based in Bangladesh, include the Asian Development Bank, the International Finance Corporation, European Investment Bank, Arab-Bangla Bank and Standard Chartered Bank of Bangladesh). Fourteen other respondents cited in the petition include the state government, the Union ministries of home, finance, forests, the national commission for scheduled tribes and the Reserve Bank of India. The litigants accuse them of dereliction of their constitutional duty to protect tribal lands and environment from local and foreign incursions. Yet another petition by a group of 10 landowners of Shella and a neighbouring village, Tynger, alleging illegal acquisition and encroachment on their lands by the mining company, has been listed. Apart from 100 ha for the mines, the company also bought 40 ha from 87 Shella villagers and leased another 3.6 ha from two villagers for its conveyor belt. These lands are protected for Khasi tribes under Schedule vi of the constitution and the Meghalaya Transfer of Land Regulation Act 1971 and their transfer to non-tribals is prohibited. But the state government had, in 2001, relaxed the provisions of the Meghalaya Land Transfer Act enabling Lafarge to acquire the land. Shella Action Committee lawyers say the acquisition violates the local land tenure system. "The land transfer is illegal and unconstitutional," says advocate B M Roy Dolloi of the action committee. "Besides, a company in Bangladesh will mortgage our lands for loans, is it proper? If it defaults on the loan then Indian land will become Bangladesh's. Indian foreign policy with China and Pakistan categorically says 'not even an inch of Indian soil will be given'. What about this land then?" asks Dolloi. Lafarge officials in Shillong, however, dismissed these allegations saying that the land had been acquired legally and with government sanction. State government officials say the mortgage doesn't pose a threat to the interests of the nation. The high court, meanwhile, has given an interim order banning the company from taking fresh loans by mortgaging tribal lands in the state and asked all respondents to file affidavits explaining their actions.